“The definition of insanity is doing the same thing again and expecting different results…"
Tell me if you’ve heard this one before: the National Energy Board (NEB) is rushing through a pipeline review with a compressed timeline and narrow scope, where it sides with the proponent more often than not (despite tremendous opposition by intervenors), and excludes the public from “public” hearings. Huge volumes of evidence are filed by the proponent in what appears to be an attempt to overwhelm and paralyze participation in the already limited timeline. For those paying attention to the Trans Mountain saga, it feels like an instant replay of the project’s last NEB review, which concluded in 2016. 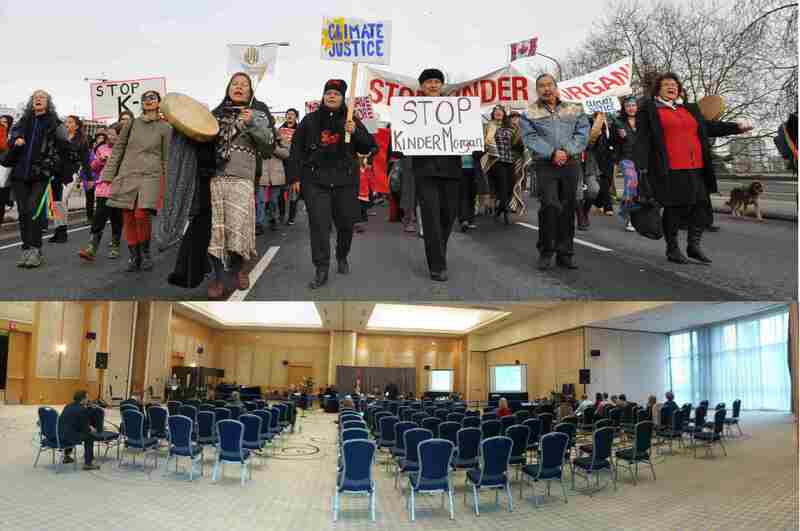 That review and the resulting federal cabinet approval of the pipeline and tanker project resulted in 15 legal challenges that led to a two-week hearing at the Federal Court of Appeal (FCA). The result? The court quashed the federal approval, based on inadequate consultation with First Nations and the illegal exclusion of marine shipping that rendered the NEB’s report invalid. The NEB took this directive and launched its new review on marine shipping by unilaterally announcing its process and giving interested parties a one-week period to apply to participate. It also asked for feedback on the proposed scope of the review on the Friday of the Thanksgiving long weekend, with comments due the following Tuesday. Despite a very short timeline (over the long weekend), thousands and thousands of letters were faxed to the NEB regarding the limited scope of the review. Side note: Did you know that the NEB will not take letters via email, only fax or in person? Because it’s 2018. Unfortunately, it appears as if the NEB is repeating the exact same errors that landed the government in court last time: rushing through a process with a narrow scope that ignores important topics and shuts out the public. As we have stated before, the NEB (and Canada’s) approach continues to be informed by a mentality that seeks to do the least amount possible, and which reads court cases like the Tsleil-Waututh through a lens that interprets decisions with an eye to the legal minimum. For example, while the court said that excluding marine shipping was a “fatal error” in the initial Trans Mountain review, it also held that other shortcomings alleged by the litigants (like excluding cross examination or not addressing climate change) were not unreasonable, which is not, as some would like to believe, an endorsement of the NEB’s process. As a result, the NEB is now only addressing marine shipping in the reconsideration, and continuing to ignore unresolved issues related to climate, economics and salmon, among other things that were ignored in the Crown’s legally inadequate consultation with First Nations. This approach risks leaving Canada with stale evidence for the redo of the Indigenous consultation process, which is still to come. So, informed by the ‘bare minimum’ approach, the NEB set out on its new marine shipping review. Almost immediately we are seeing the same patterns emerge. One example of the NEB opting for a minimal approach is the geographic scope of the marine shipping review. The NEB asked for intervenors to comment on whether it should consider impacts within the 12 nautical mile (NM) territorial limit, or the 200 NM exclusive economic zone (EEZ) in which only Canada has the ability to regulate. Only the Government of Canada, Alberta and Trans Mountain supported the 12 NM limit, while the vast majority of intervenors including First Nations, the State of Washington, community groups and others supported 200 NM – but the NEB still ruled in favour of limiting its review to 12 NM. This was despite the obvious fact that the project’s 400+ tankers per year will not stop at 12 NM, that an oil spill will not respect this arbitrary line, or that the southern resident killer whale’s critical habitat extends beyond 12 NM. The NEB also refused calls from intervenors to re-examine the underlying need, or economic case for the pipeline. A lot has changed since the project was first filed by Kinder Morgan back in 2013, when oil was well over $100 a barrel (today it is around $60, with oil sands fetching around $20). Oil transportation economics have or will soon be disrupted further. Very Large Crude Carriers (VLCCs) in the new Louisana LOOP terminal will magnify the market forces hindering Canadian producers; new fuel standards regulations will reduce the demand (and therefore price) for sulphur-heavy oil sands products; and climate commitments in Canada and globally will also impact demand. Finally, Canada’s overpayment of at least $1.2 billion for the pipeline has never received any public scrutiny, and the estimated $9+ billion construction cost is only climbing higher, without any public oversight. Note: Canada Development Investment Corporation (CDEV), the Crown Corporation parent to Trans Mountain Corporation, is scheduled to release some cost updates in late November. Climate impacts are also once again being excluded from the NEB review, despite the fact that the agency had decided to review upstream and downstream emissions from the Energy East pipeline before Trans Canada abandoned the project because it was uneconomic. Trans Mountain was uneconomic even without a climate test, but Kinder Morgan was able to pull a fast one on Canada and salvaged its losses by selling the project. One would hope that the NEB would take the opportunity to correct these other gaps while redoing its review. Another example of the NEB’s flawed approach is the exclusion of salmon spawning habitat, particularly given that the review is also supposed to be about the fate of the endangered southern resident killer whales. Scientists agree that one of the main threats to the iconic species is a lack of its primary food – Chinook salmon. The noise from tanker traffic also impedes the whales’ ability to hunt these salmon (and a spill would obviously be detrimental), but the salmon’s upstream spawning grounds are inextricably linked to their health. It was in some of these same spawning grounds that Kinder Morgan was caught illegally installing anti-spawning mats. The interconnected nature of the rivers and streams that flow into the ocean, and the salmon that rely on these networks to reproduce, underscores the folly of segmenting sections of the review as if they were independent. The reality is that what happens in these streams impacts the whales because it impacts the salmon, so any review that does not consider this is not getting a full picture of the impacts on southern residents. These are just three examples of the issues that arise when you scope the review of a project as narrowly as possible. Despite repeated calls for a longer review, the NEB’s hearing order set an incredibly tight timeline for its process. This is, in part, because the NEB does not have the same powers to start and stop time as it did in the original review. That means the only party that can extend the process is the federal cabinet. Many intervenors were dismayed to see that the hearing order gave them only five weeks to file evidence (until November 20th). For many, this requires finding and hiring available experts to produce a report and review existing evidence – a nearly impossible task. After contacting multiple experts who were unable to draft a submission in less than a month, the Wilderness Committee ended up declining $25,000 in participant funding due to the NEB’s unreasonable timelines. To be fair, the federal government and Trans Mountain were also subject to the NEB’s tight timeline, and indeed on October 31 they filed evidence and statements that together totalled 8,033 pages. This puts intervenors and their experts in an even tougher position – experts will now have to review all of this evidence before even starting their own reports. In addition to the obvious disparity in financial and human resources available to the federal government and Trans Mountain compared to intervenors (including First Nations, community groups and affected individuals), the former also have a distinct further advantage. Remember, it was cabinet who set the timeline for the review, and cabinet who knew when they were going to make the announcement. Ministers would have known that their 22-week timeline would result in a compressed schedule, so it is possible, and even likely that the work to prepare the evidence was underway well before the NEB issued its hearing order on October 12th. Likewise, Trans Mountain Corporation, which is now owned by the federal government, may have known about the timeline and begun work early. There is nothing illegal about beginning work early, but this example underscores a major complexity in the current review: now that the proponent of the pipeline is effectively the federal government, how can that same government objectively review, regulate and enforce laws against a project that it owns, and has already invested so much public money and political capital into? With so many possibilities for conflicts of interest, and gaming the system, it will only complicate an already complex decision for cabinet. The federal government will have to navigate the legal requirement to make a fresh decision, while depending on stale evidence and continuing to suggest that the decision is already made. On November 5th, the Squamish Nation filed a motion with the NEB, asking for an extension of time to file expert evidence. Squamish asked for an extension of 15 days, which, if not granted would prevent Squamish from participating in the process fully, but maintained their primary complaint that the entire NEB reconsideration process was too short. On November 13th, the NEB decided to grant the extension, and compress the rest of its process. But as we have stated above, it will still be constrained within the timeline set by cabinet. Only cabinet can extend the deadline beyond February 22nd, 2019. On November 16th, Tsleil-Waututh Nation filed an application for review of the NEB’s hearing order. The application challenged the decision to exclude the exclusive economic zone from the marine shipping review, as well as the exclusion of socio-economic effects from the scope of the reconsideration. Tsleil-Waututh also argued that the NEB process violates a fundamental administrative law principle (“they who hear must decide”) by adding panel members who had not heard the previous evidence directly, while still having them reconsider and decide on issues raised by that evidence. Just as we were preparing to share this post, the NEB set a process for comment on Tsleil-Waututh's application, with a two-week turnaround for intervenors to provide their input. So the NEB is off to another rocky start; something we’ve seen before. With the recent Newfoundland oil spill now deemed impossible to clean up because of weather, it has never been more important to have fulsome processes to evaluate the risks of marine shipping. We still don’t know how the federal government will follow up on this NEB review with further Indigenous consultation before making a fresh decision. But for now the main question is: how much longer before we’re back in court?